Corporate interiors should be a reflection of your brand. 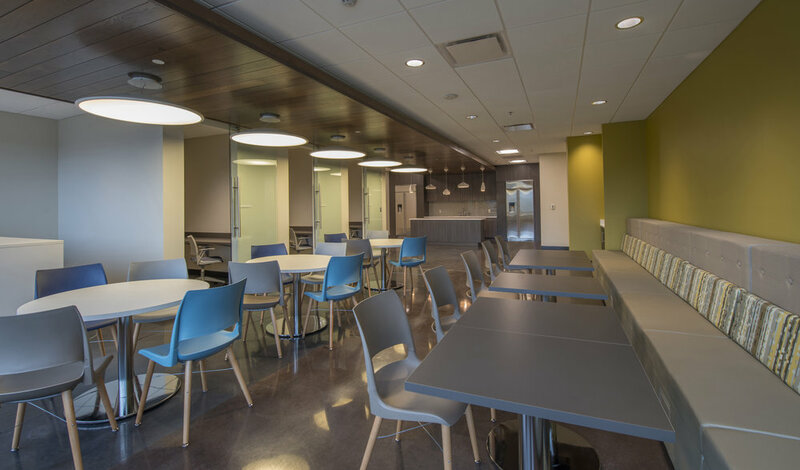 We create unique spaces that set you apart, provide a great recruiting tool and establish highly efficient work environments for productivity. Our staff consists of five registered Interior Designers and one LEED accredited professional with a collective experience of more than 100 years. Our background in both architectural and furniture industries makes Hatcher Schuster Interiors unique to the design field. We work as a team from the project’s inception and through design phases making the final decorative appointments to the space. Residential design is a thoughtful process. Interiors should reflect the homeowner, be a place of refuge and tell a story. High quality design is the hallmark of our company’s work, regardless of its size or classification. Our creative and hard working designers make the difference, by producing a large quantity of high quality work. This provides the client a great value for the service and excellent interior design solutions. We strive to create an overall experience with attention to every detail. From the lighting to the tactile finishes and the way a chair feels, every choice is important to leaving a lasting great impression. Our services range from programming and space planning to the furniture selection and decorative treatment of the spaces. We have in the last 35 years established a strong reputation for listening to the clients needs and for meeting the client’s time and budget constraints. Build healthy and positive spaces. A great interior can provide a better environment to promote healing. Evidence based design practices provide a powerful tool in the design process. Hatcher Schuster Interiors uses evidence based design to create healing environments. We strive to provide a timeless interior that promotes health and wellness for patients. Healthcare environments need to function well, provide a beautiful aesthetic, be easily maintainable and have anti-microbial properties. Every detail is important. Art packages create the finishing touch for a cohesive interior. Hatcher Schuster Interiors believes in creating an interior that is cohesive with the overall design. A well curated art package can provide the final finishing touch to finish out a space.